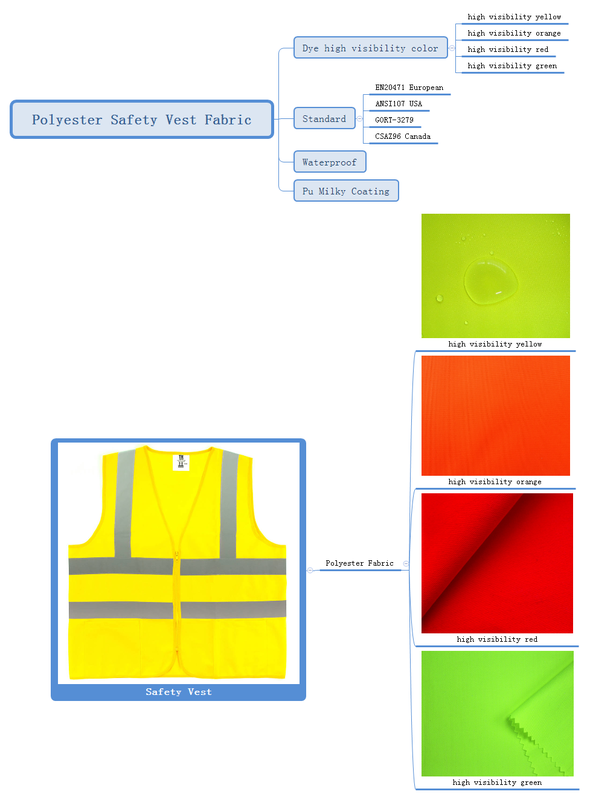 The main material fabric of Safety Vest is Polyester High Visibility Fabric, also called Hi Vis Fabric. There are normally high visibility yellow, high visibility orange, high visibility red and high visibility green, total four colors. People can see these colors clearly and it will be safe when working. Fabric are usually finished with waterproof pu coating to help to protect body from water, wind, etc. A safety vest is a type of apparel designed to keep the wearer visible and to designate authority. Safety vests often feature high visibility colors like yellow/lime and orange. Silver reflective stripes increase visibility, especially at night and in difficult weather conditions. Where it is used in? Occupational wearers of clothing with high-visibility features include railway and highway workers, airport workers, or other places where workers are near moving vehicles or in dark areas. Some cyclists wear high-visibility clothing when riding amongst motor vehicles. Hunters may be required to wear designated high-visibility clothing to prevent accidental shooting. We are fabric manufacturers, control each process including fabric weave, dye color, waterproof pu coating, packing during fabric making and shipment. It will control the quality well, save the cost and time directly.